The TPJ Fly Racing team travelled to Buchanan, MI to compete at the Red Bud National as a part of the Lucas Oil Pro Motocross series. Redbud takes place over the 4th of July holiday weekend, and is one of our favorite rounds. As you may know, two of Ted Parks favorite things are America, and motocross. 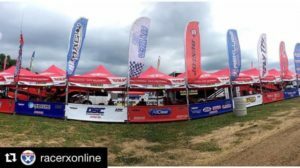 If you follow Racer X Online or Pro Motocross, you might have seen some behind the scenes action under the TPJ Fly Racing tent. We want to extend a special thank you to the Racer X/Pro Motocross team for taking the time to hang out with us. This week we had five athletes competing. Dustin Pipes, John Short, Michael Docherty, and Chad Gores in the 450 class, and Blane Silveira competing in the 250 class. Of our five athletes, John Short would go on to qualify for the main event at Redbud after winning the consolation race. Docherty would narrowly miss the main event from the consolation race, and Silveira had mechanical problems in the 250-consolation race. The obstacle-ridden track and ever changing conditions proved to be difficult for even the best riders. Short was back with a fire after bad luck last week cut his race off early due to a mechanical problem. He finished his first moto in 17th place, and in his second moto he finished 15th & placing 16th overall. Short continues to climb the ladder each week, and we are looking forward to seeing what he can do at Southwick. In other good news, Mason Wharton visited the doctor last week after what was believed to be a season-ending shoulder dislocation. We have learned that he should be able to rejoin us on the Lucas Oil Pro Motocross series at the Millville round. We are thankful that the injury was less serious than we originally believed, and we are looking forward to having him back at the races with us. We are now turning our focus to Southwick. We hope to have more main event riders this week and to see how much closer Short can make it to the top ten. We are very thankful to the sponsors who have been supporting our team this season, whether it be through the highs or lows. As the underdogs, these athletes have the potential to get to the next level; they just need a boost and the resources. Thanks to Ted Parks and the TPJ Fly Racing team sponsors, we are continuing to see these riders progress each week. We are looking forward to Southwick and hope to see you there!